This work was painted in March 1963, a period in which Delvaux again felt strongly attracted to the subject of trains and stations, which he discovered very early on in his career. Towards 1920, at the time when he was attending the Académie, he got into the habit of painting at the gare du Luxembourg in Brussels. Later, he drew inspiration from the little foresters' station in Boistfort, the borough of Brussels where he lived. Evoking Delvaux's world without referring to trains is impossible, since it is a recurring theme in his work. Here he reveals himself as a painter of reality, of a meticulous reality. In Delvaux, no detail is left to chance, and each element is studied in depth. In fact, he ordered scale models of trains and trams which reigned over his studio, next to a skeleton, another important source of inspiration. That way, every time he wished to do so, he was able to copy them carefully and integrate them in his works. The Viaduct is a very interesting piece, because it gathers in a single, very dense composition, all the elements which constitute the artist's world: the suspended lamps found in his childhood homes, the magical and unusual atmosphere of the stations at nightfall, the mysterious train passing and covering the horizon with its strange smoke, the mirror reflecting another world, another reality. And absence, too. Everything is fixed, inanimate, waiting for an event which does not take place. The work frightens and at the same time fascinates, since it is inhabited by poetry. The houses are lit, but no human being seems to live in them. No life animates this composition constructed like a theatrical scene. 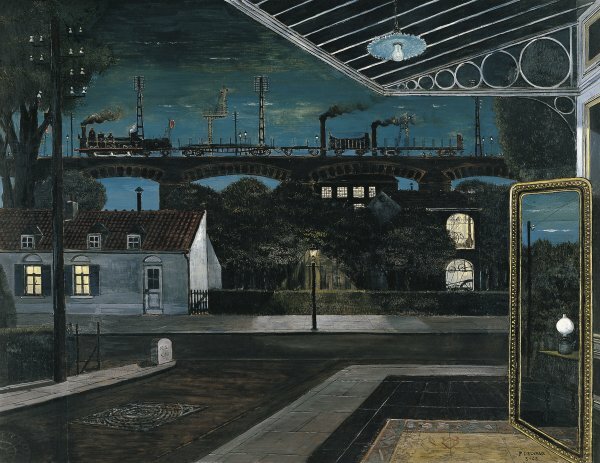 There is the foreground, with that strange mirror whose presence in a street or under a shelter, reminding us of a train station, is unreal; and the background scenery: a train passes and seems to float in the night sky. Such a particular world is made of simplicity and reality but, due to the contrasts existing between the real elements and their anachronistic association, the artist creates unreality, "daydream", poetry. It is through the pretext of the image that Delvaux reveals the mystery, the source of poetry and of bewilderment since, although all the elements of the painting are realistic, the image as a whole is not. The oneiric world and the natural world merge into each other, thus creating the extraordinary. In his work, time no longer exists, and neither do epochs. All the logic is abolished for the sake of expressiveness and of the real meaning of the work: poetic evocation. Delvaux as a man and as an artist is a world of sensations, of impressions, of marks left in the deepest corners of a being. He pushes his roots into childhood, remembrance, memory. Everything exists, everything has a name, everything is known by everybody and can be grasped by everyone, but Delvaux, like a magician, upsets the established order, the hierarchy of genres, puts together things that usually are not, brings opposites closer, changes the course of history and makes fun of time and space. With traditional materials, he creates what has been called "the world of Delvaux". A world which belongs to him and will never be imitated, a world consecrated to a single divinity: Poetry. Once conquered, that kingdom will remain unchangeable, it will invade all his works from 1935 onwards, and will develop up to his old-age paintings.